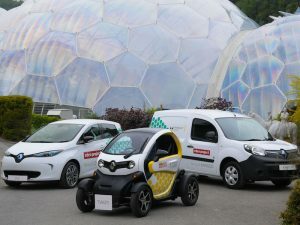 The Eden Project has reported a significant drop in its fleet running costs after deploying electric Renaults a year ago. The zero-emission vehicles can be used inside the Biomes where diesel or petrol vehicles can’t. The Cornwall-based environmental tourist attraction took delivery of 18 EVs a year ago – covering a mix of Twizy quadricycle, ZOE supermini and the Kangoo Z.E models – and says it’s seeing savings on road tax as well as pence per mile running costs, which are down to 4.4p compared to more than 11p for equivalent diesels. The zero-emission vehicles also offer the benefit of being able to work inside Eden’s Biomes where diesel or petrol vehicles can’t because of pollution concerns. As well as transporting guests and staff around the site, the electric vehicles have also played a key role in marketing operations for the project, with the Twizy fleet even having been drafted in as Father Christmas’s reindeer for the Christmas period, complete with festive roof antlers, and have also played a key role in last summer’s interactive electric vehicle exhibit.